The Keely dress is one of the new Hell Bunny pieces that I somehow manged to totally miss when I previewed the line at London Edge this season. I don’t know how, because when I flicked through their complete catalogue online a couple weeks later it was an instant screen-shot, must-have piece. It’s more of a 40s cut than my usual fare, but I was really excited (and only a little bit anxious) about trying it. I needn’t have worried: this dress is amazing. With a full skirt and a modest but prettily pleated bust, it’s work appropriate, vintage inspired and downright beautiful. It was only earlier this year that I finally acquired my first Trashy Diva pieces, but in doing so they swiftly became one of my favourite vintage inspired brands. I only own 3 of their dresses so far, but literally every time I wear them they receive compliments. The designs are always so beautiful, with even their plain coloured pieces featuring eye-catching design details that set them apart. With the new Venice Nights line released this week, there’s no plain pieces in sight, only gorgeous, vibrant styles sporting a fun 40s-inspired novelty print, the likes of which Trashy Diva are renowned for producing. Gondolas, bridges, and Venetian buildings all make an appearance in this print set against a rich blue background. The collection features 5 dress styles, 1 blouse and 1 skirt, so there’s plenty of style variety to choose from. I was sent the Circle Day Dress, a beloved older style that Trashy Diva are excited to be bringing back. After strolling and twirling in this piece at sunset, I can see why. A few months ago I was minding my own business on Instagram when I came into contact with a fellow blogger, @AmberRoseTheron, AKA Atomic Amber. It only took a couple minutes of talking to realise that not only was Amber a doll but that she lives only 5 minutes down the road from me, literally. Here I was swanning around the rural English countryside thinking I was the only pinup this side of the big city and I had a fellow pinup swanning around likewise close enough to eat cake together and talk about clothes whenever we so desired. The odds! Since then Amber and I have become fully fledged members of a 10-member strong vintage girl gang, The British Belles, but since Amber specifically lives so conveniently near me and is such a little lovebug, she and I have decided to launch a blog collab series together–2 Girls 1 Dress. Amber and I love a lot of the same pinup brands, to the point that we even own several of the same dresses, so from time to time we’ll be joining up to showcase these matching gems for you to show you different ways to style the same dress and give detailed reviews of each dress for your usual info dosage on fit and such like. 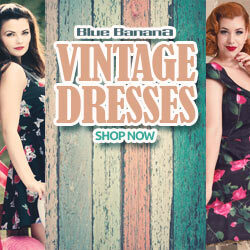 Our debut post brings you the Pinup Girl Clothing Lavender Jenny Dress. Lavender is a new colour for me, as I’m not a pastel kind of girl, so thus far I’ve enjoyed styling this dress with an Ice Princess kind of theme to embrace the winter chill and to give myself an excuse to add glitter and sparkle in abundance. I want to get white heels and a white cardigan so I can wear this dress in full-on frost mode, but for now creams and ice blues will have to suffice. I took myself off into my frosty garden to show you the wintery way I’ve most recently styled this dress.